For 150 years Lourdes has been best known for the apparitions of the Blessed Mother (who called herself the "Immaculate Conception" when she appeared to the young Bernadette Soubirous). 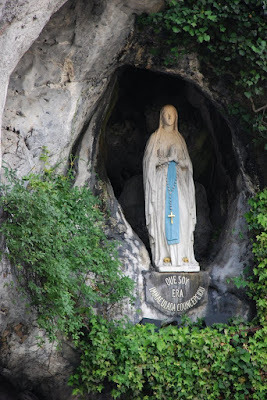 Since that time, Lourdes has been a popular pilgrimage site, with many reports of miracles and healings from those that bathed in the waters of the spring that erupted from the ground at the very place where the Blessed Mother stood before the young girl. I received this account from Pam Pedler, who first published it in the "Denver Catholic Register." I met Pam at CWCO 2009 this year, and am running the article here as part of the Lent/Easter Mary Moments Carnival. Enjoy! Palm trees stood against the back drop of snow capped mountains. The balmy weather in the Pyrenees was unexpected after three bitter cold days in Paris. This was Lourdes, France, and once a seemingly impossible destination for my travel. Lourdes had been a late addition to our inaugural trip to Europe. How could I go to France, and miss visiting the birthplace of Bernadette Soubirous, and the site of an 1858 nonfiction story of David and Goliath magnitude? The production of The Song of Bernadette captivated me as a child, so much so that I choose Bernadette as my confirmation name. When I realized our trip coincided with the 150th anniversary of her apparitions, I meekly asked my family if we could squeeze an overnight visit to Lourdes. It required a five hour train trip each way from Paris. Millions of people arrive each year. It is only second to Paris as a tourist destination in France. Lourdes is a place to rest; to unplug and absorb the calm. Some curious visitors come hoping to see what others see, and what they do not comprehend. Many others surrender their suffering here, and that in itself is a healing. Not all healings are physical; most of the spiritual healings are know only to the recipients. The miraculous spring waters that Bernadette revealed by digging in humble obedience, remains a free gift today. Its’ grace flows from God through Mary, to open hearts that seek. I had never traveled as a spiritual tourist. I am a private person. Somehow our trip expanded into a personal ‘pilgrimage.’ The word - uncommon in modern times, was a foreign experience to me. I felt drawn to present myself in gratitude to an inspirational woman, who is a constant source of mercy and guidance. I wanted to touch the rock where this female role model of all time, our Mother Mary, presented herself to an impoverished girl of fourteen. My impetus to take on such an unlikely mission was thankfulness for the mercy granted during my father’s final days before his death. Stomachs growling, we stopped to eat. The waiter took our order, and we looked out large windows upon a narrow, two lane intersection. We could even hear the groups of people singing, and smiles abounded. No one was hurrying. It really felt like a different country! 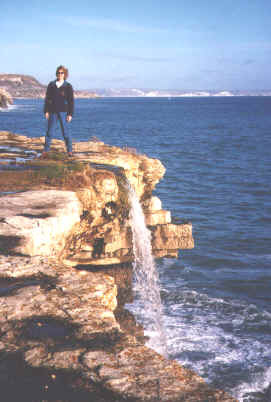 Intrigued, we set out on foot to find the Grotto. We took several wrong turns, using our mistakes to observe the sites and people. Our Mother Mary, in her usual fashion, led us first to her Son. Stepping out of a mist of drizzling rain, we were drawn into wooden doors by singing. Sliding into a pew to listen, we realized a Mass was starting, in French. Accidentally, as if by another’s design we first attended Mass and received Eucharist. Only afterwards did we behold the grotto. Walking around the back of the Basilica, we descended switchbacks towards the Gave River. There it was, just like my mind’s eye had imagined. The cave’s rock darkened from a century and a half of candle flames, stood witness to heaven reaching out to guide humans. A white statue of the Virgin Mary stood in her cove engaging one’s mind and heart. I placed my hands on the rock beneath where Mary appeared eighteen times to Bernadette. Our Mother Mary had requested prayers, and penance then. I offered up a simple prayer, “Thank you for your mercy. Present us to your Son to heal us, and our family and friends, of what we need to be healed from. You know better than us, what that may be.” After a reverent kiss of the stone below the apparitions, my hands were scented with a beautiful floral aroma that lasted even after the next morning’s shower. We collected water from the spring’s source to share with family members. Submerged in the experience, and praying for our friends and family’s intentions, I surrendered to rinse my face in the water, and drink it with unusual openness. My son insisted we go to confession in the English speaking confessional, for the fullness of grace. Our priest was from England. Lourdes is a holy and joyful place of unity among Christians and non- Christians alike. While lighting candles in a centuries old tradition, I was warmed by connecting to the Church Body that preceded me; Bernadette and all the saints of the past two millenniums. Making our way back to our hotel, we stopped in the multitude of tiny shops. The incongruence of materialism on the doorstep of the sacred was disconcerting. It seemed opportunistic. It wasn’t until I returned home and read The Fluorescent Virgin, in the The Wonders of Lourdes,* that my eyes and heart were opened to the distraction. The merchant’s story tells of how he owed his life to a religious trinket. In his words, “God takes any shape he pleases to help us believe in him, to keep us near him. Don’t mock the faith of the simple for it touches God’s heart just as much as the faith of the saints does.”* To my surprise I found a fluorescent virgin in the bottom of my bag at home. Had I been in his store? I was so grateful to extend the Lourdes experience with this book. Since returning home my trip is re-stirred daily, prompting peaceful contentment. Lourdes is a place on earth, where the holy touches both the ordinary tourist and a modern pilgrim.